As a global industry, aviation produces 2% of the planet’s total carbon dioxide emissions. Its outlook isn’t good either, because it’s projected to grow by 3-4% each year as the industry expands. While air travel has become 70% more efficient per seat-mile than when jets first began operating in the 1960s, the industry’s growth has resulted in higher overall CO2 emissions. 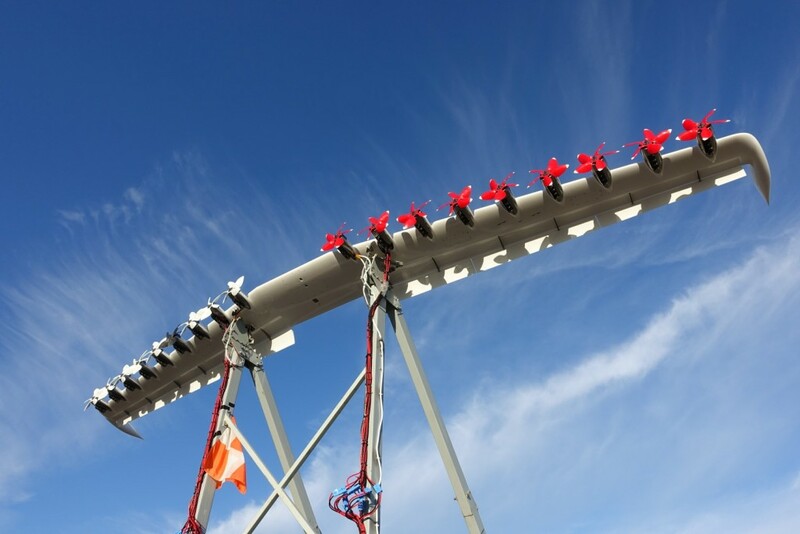 NASA’s project LeapTech is in the process of testing a new approach to powering flight. The concept is called distributed propulsion, and it’s the future of low-carbon aviation. The project features a 30-foot airplane wing – the kind found on a small plane. 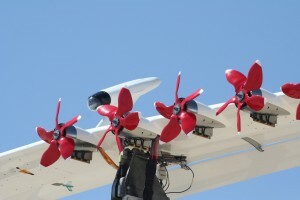 The new wing design has 18 electric motors with small propellers along its leading edge. 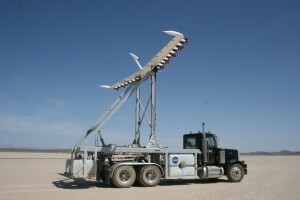 Engineers attached the wing to steel supports on a Peterbilt truck, and have been simulating takeoff and landings at the Edwards Air Force Base in California. They have driven the wing-truck contraption down the runway at more than 70 miles-per-hour. The idea behind distributed propulsion is to take the engines from their usual position hanging below the wings and put them elsewhere. Because jet engines are complex, heavy devices, distributed propulsion designs almost always involve simpler and smaller electric motors. Distributing the motors around the plane (instead of in just one spot) has aerodynamic advantages. The position of the motors on the leading (front) edge of the LeapTech wing results in accelerated airflow over it, which increases lift at takeoff and landing. Because of this, the wing can be made narrower, which reduces drag and improves efficiency at cruising speeds. In terms of reducing an airplane’s carbon footprint, the key is cutting down on the plane’s weight and drag, and reducing the engine’s excess fuel burn. Some planes have been partly redesigned. In the coming years, Boeing will introduce the 777x, a variant of their 777 model. However, the new design of the 777x features composite wings and more efficient engines than the traditional 777. But the basic design of airplanes still remains the same – a tube and wings. Besides NASA’s LeapTech project, there have been other innovations in airplane technology. Engineers have made planes lighter by using composite materials, jet engines have become more efficient, and alternative biofuels are increasingly being used. Better management of airplane traffic at airports and in the air has also reduced emissions. Many of the aviation industry’s improvements involve changes to existing planes though – like replacing older engines with more efficient models, or adding winglets to wings to reduce drag and improve efficiency. In the future, NASA thinks that planes could be powered by hybrid gas-electric systems or by batteries. Potential designs could have lighter wings that can quickly shape to handle turbulent air. Other concepts could eliminate the conventional tube and wing design for one that blends the two elements. For NASA, the next step is modifying an actual aircraft to operate with batteries and wing motors. NASA’s LeapTech project uses batteries, but the modified aircraft will only be able to make short flights because of the current limitations of batteries. All-electric planes may never be a practical option, but a hybrid turbine-battery design could be a reality. Despite these scientific advancements, emissions from the aviation industry are still growing at a rapid pace. The International Civil Aviation Organization, a United Nations agency, projects that the worldwide commercial fleet will double to 40,000 airliners in the next 15 years. A recent report from the European Parliament revealed that international aviation could be responsible for more than 20% of global CO2 emissions in the near future. Aviation emissions impact cloud formation, ozone generation, and methane reduction, so the report’s projection isn’t a good sign. In order to deal with the rising growth of the aviation industry, we must make drastic changes to airplane design to protect the environment. NASA’s LeapTech project is a step in the right direction towards making airplanes more eco-friendly, and more airplane engineering companies should take note.